The 1665 Marci Letter: A Forgery? One of the keystone items of evidence used to support the claims that the Voynich Manuscript is a genuine, ancient work, is the 1665 Marci-to-Kircher letter which Wilfrid Voynich said he found in the book. But does this letter deserve the important, foundational aspect it has been imbued with? Or is it rather a somewhat shaky document, with numerous troubling anomalies, which deserves to be questioned? I will below list some of the letter’s problems. But first, let us look at what the letter tells us, and the claimed circumstances surrounding its discovery. Wilfrid Voynich claimed he purchased his “Roger Bacon Cipher Manuscript” from the Jesuits at the Villa Mondragone about 1911/12. This was the story he privately imparted to his wife, Ethel, but only to be revealed after her death. Before that, he claimed that the book was found, alternatively, in “A castle in Southern Europe”, and “An Austrian Castle”. By the time Wilfrid exhibited his Cipher Ms. at the 1915 Chicago Exhibition, he was telling people that he had noticed the letter… sometime after purchase of the ms…. either attached to the inside cover of the book, and/or folded within it. The letter now resides in the Yale Beinecke Library, as part of the Voynich collection there. 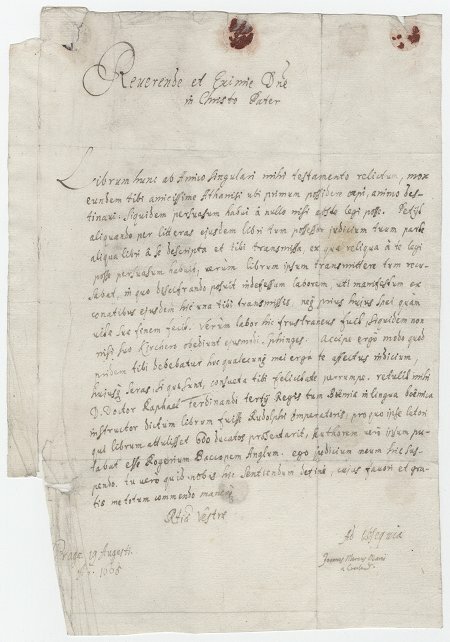 This letter is the source of information for the rumor that the Voynich Manuscript was written by Roger Bacon, and also that it was brought to the Court of Rudolf II by a “bearer” who was given the enormous sum of 600 ducats. 1. Voynich said he paid little attention to it, at first: His claim is somewhat implausible, considering how stunning and mysterious the Voynich Ms. is, and seemed to be to him. So of course any included documents would have also been of tremendous interest. This, especially, considering that an even cursory scanning of the letter would reveal the phrase, “Rogerium Bacconem Anglum” (“Roger Bacon, the Englishman”, Philip Neal translation). I think his claim would actually suggest that this letter actually did not exist earlier, and so he needed to also claim he only noticed it at a later date… or how else would he explain not mentioning it earlier, to whomever he may have described, or shown, the ms.? 2: He walked out of the Villa with it: The Villa Mondragone was the repository of the Jesuit’s precious Kircher Carteggio, a 2,000+ item collection of correspondence, in 12 to 14 packages, between various individuals and their esteemed and iconic Athanasius Kircher. So we must believe that not only did Voynich not notice that letter inside his stunning find, but also that no Jesuit took the time to examine the work he was offering to purchase from them. 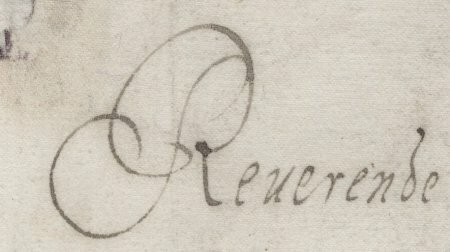 At least, well enough to notice one of their precious Kircher letters was inside. On the contrary, I think this also suggests this letter was forged later, by Wilfrid (or someone else), to create, change, add and/or cement his desired provenance. 3: Marci held back information? : When reading the other letters to Kircher which are presumed by many to describe the Voynich Ms. (I would contend they are probably describing some other work, NOT the Voynich Ms.), i.e., the Baresch, Kinner and other Marci letters, it is clear that these men are very interested in getting an opinion from Kircher about this work. So then why would they not mention, and why would Marci wait to mention until his last, dying years, and only in his last request to Kircher, the important clues contained in that letter? Voynich’s 1665 Marci letter first mentions the rumor of Rudolf II buying it from a bearer, or otherwise paying that bearer, 600 ducats. And it mentions the guess that Roger Bacon wrote it! But confoundedly, Baresch, Kinner and a younger Marci fail to mention any of this to Kircher, for decades. I would contend this implies that this information was made up, for a forged letter… and further, that that forged letter had to be dated much later than the others, because it would have been even more incomprehensible that the included information was not a part of earlier (and genuine) missives in the Carteggio. 4: That Latin: Many who are proficient in Latin have had difficulty with various aspects of the Latin phrasing and/or grammar in the letter. I know little about Latin, and cannot intelligently contribute to any translation. But I can point out that others have had trouble making heads-or-tails of it. This is not to say any of these people suspect the letter as I do, but of course I consider this an important observation. For instance, in the list of Philip Neal translations, this letter is the only one that demands “extra notes”, in some attempt to better understand the problematic logic of the Latin phrasing. Neal calls it “vexing”, in fact. I would suggest the logistical problems with this Latin phrasing are a result of a modern forger who was not proficient enough to create a trouble-free version. 5: The Folding: There were two basic ways a letter was prepared for delivery in the times before manufactured envelopes became available: One, the letter itself was folded into an envelope, with the writing to the inside and the address on the outside. Then this was usually secured with a “wax” seal, impressed while hot with the emblem of the sender. Another way was to fold the letter, but then place it in a dedicated envelope made from another sheet of paper or vellum, which was then addressed and sealed. The second way seems to have usually been used when the letter had writing on both sides, or one had multiple sheets. I have seen images of all the letters of the Kircher Carteggio, and the fold lines and seals make sense for one of these two uses. There are small variations in the size of the sections folded, or whether or not a flap is made for the seal, and so on, but they still make sense. The 1665 Voynich/Marci letter seems different, and odd, in this area. So I printed out the 1666 Marci letter, and tried to fold it on its apparent fold lines. There are ways to fold it, but they do not make sense. It is as though the letter was trimmed down from a larger source, that was previously folded, with new fold lines added. 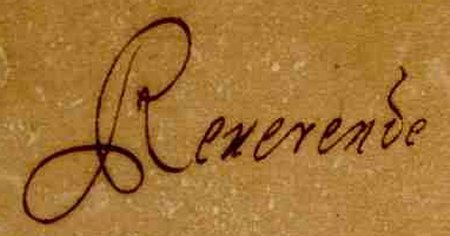 The fact that the Beinecke lists the letter as being blank on the reverse (hence no address) does imply this was meant to be included in another sheet, folded as an envelope… but then, why are there seals on it? It has been suggested that the seals were used to attach this letter inside the cover, or some pages, of the Voynich… but this is also not a usual practice, and then, since the cover is considered newer than the book, and newer than the letter for that matter, why do the seals and their marks line up as though they were part of the letter itself, when folded? I think these anomalies suggest that the 1666 Marci letter was created from another source sheet, which was possibly trimmed down. This source may have had seals on it for some purpose, perhaps as an unmarked envelope. Perhaps an original address was trimmed off, or erased. This source had some folds, but others may have been added to create what we see today… an odd format with seals and folds that cannot be made sense of. Related to this is the known fact that Voynich had access to a tremendous amount of blank paper from the end-sheets of books, and possibly other sources. In fact it is related both by James McBey, the famous etching artist, and Millicent Sowerby, a Voynich staff member and biographer, that Voynich sold ancient, blank paper to McBey. 6: The “Signature” & Date: It has long been known that the “signature” of Marcus Marci is not by him, as it seems to be different on his other, earlier letters. This has been explained by the fact that Marci was very old, and ill at this point, and some scribe wrote and signed the letter for him. But interesting to me is the almost pantographic ability of this scribe… because in the Kircher Carteggio is one, later, Marci letter, dated September 10, 1665, seemingly by this same scribe… but if so, why are the signatures an exact overlay? Further, the year overlays perfectly, bringing to mind the consternating problem of old difficulty in determining if the Voynich-Marci letter was dated 1665 or 1666. This, because the last “5” lines up, but then it seems a small loop-closing line was made to this “5”, turning it into a pseudo-6. Could this be because a second-thought caused someone to think 1666 would be better? In a similar manner, the “10” of September 10th also lines up perfectly, but the Voynich-Marci letter has a tail, seemingly added to turn the “0” into a “9”. Opinions & Interpretations: Whether or not the Voynich Manuscript is a genuine 15th century cipher-herbal, I think the above problems and anomalies suggest that the 1665 Voynich/Marci letter was created to either change or cement a provenance and authorship which Wilfrid Voynich desired: To imply that his Cipher Manuscript was in the Court of Rudolf II, and that it was possibly a lost manuscript of the great polymath Roger Bacon. A motive could have been the tremendous potential increase in value, because while an interesting herbal of the time might have been worth as much as, say 1,000 pounds, Voynich wanted over $100,000 for his lost “Roger Bacon Cipher Manuscript”. Helping feed his hopes may have been the excitement of the upcoming 700th birth anniversary of Roger Bacon, in 1914, and the surrounding media attention. But if this is correct, I would contend it further undermines the case for authenticity of the Voynich Manuscript itself. It would not only further impugn the already shaky word of Voynich, so often relied upon for the little we know of his famous manuscript, but it would also leave the other letters, genuine and still in the Carteggio, supposedly describing the Voynich, as little isolated islands, barely describing anything close to the Voynich manuscript we see today. In fact, if we did not have this 1665 Voynich/Marci letter, no one would ever suspect the genuine Baresch, Kinner and other Marci letters would have anything at all to do with the Voynich Manuscript. In the August 19, 1665 letter from Johannes Marcus Marci to Athanasius Kircher (claimed to have been found by Wilfrid M. Voynich in the famous “Voynich Manuscript”), Marci relates the rumor that he had heard about the authorship and previous ownership of the work. Although I contend that there are many reasonable concerns about the authenticity of the letter itself: its contents, and its back-story by Voynich… I wanted to focus on this one aspect, the rumor, in this post (well, I will also add some points about the De Tepencz signature, which coincide with these observations). “Doctor Raphael, the Czech language tutor of King Ferdinand III as they both then were, once told me that the said book belonged to Emperor Rudolph and that he presented 600 ducats to the messenger who brought him the book. He, Raphael, thought that the author was Roger Bacon the Englishman. I suspend my judgement on the matter.” [Philip Neal translation]. “The source of the acquisition by Rudolf is Dr. Raphael Mnišovský, once teacher to the young Ferdinand III, who later also was emperor of the holy roman empire. Mnišovský died in 1644, so this piece of information was more than 20 years old when Marci wrote his letter to Kircher. Furthermore, Mnišovský was referring back to events that took place at least 55 years before Marci’s letter, possibly even significantly longer. There are, however, reasons to believe that both men would remember the essential details correctly. Mnišovský was long interested in the manuscripts of Rudolf and the Voynich MS was something that deeply interested Marci since many decades. Still, it is certainly possible that the amount of 600 ducats is not based on fact, but possibly an exaggeration to interest Kircher”. Now consider this against the timeline of all the letters of inquiry to Kircher which relate to the manuscript: Beginning with the (now lost but loosely described) 1636/37 letter, and the surviving 1639 letter, of Barschius to Kircher, we know that Barschius, Marci, and later, Kinner, were greatly interested in having Kircher identify the language, characters, illustrations and meaning of the book “uselessly taking up space” in Barschius’s library. It is conceivable that at the time he wrote his first two letters, Barschius did not know of the Roger Bacon/Rudolf II/600 ducats rumors, and so, did not include them. But I contend he most certainly would have included the rumors, had he known of them, as they would have certainly been deemed very helpful to Kircher in solving his riddle. I will also point out here that Barschius made no mention of the De Tepencz “signature”, in the letter which survived. This should have been visible… as it was pre-1919 still visible… and it also would have been of great importance to the identification of the manuscript. “The Sph*nx will understand from the attached sheet what my friend Mr Georg Barschius wanted to have written by me. Though he is undoubtedly a man of the highest quality and greatly skilled in chemical matters, he has not in fact achieved the real goal he longs for. He seeks it for the sake not of money but of medicine. [Philip Neal translation]”. In this, we see that Marci has now taken up the cause of goading Kircher to solve the mystery of the Barschius (Voynich?) manuscript. However, he again does not mention the Roger Bacon/Rudolf II/600 ducats rumors to Kircher. This makes no sense, unless one wants to assume that Marci had not yet been told these rumors, by Mnišovský. The doctor was to live another four or so years, and perhaps only told Marci some time later, up to his death in 1644. But Marci again does not write of the De Tepencz signature, which is inexplicable. Kircher had not yet seen the manuscript, and so anyone would consider this a valuable clue that Kircher should know. A year later, in Marci’s 1641 letter to Kircher, Barschius is mentioned in passing, but the mysterious manuscript is not mentioned at all. No “rumors” mentioned, either, nor “signature”. In fact, Marci does not again write of the Barschius Manuscript until the 1665 letter that Voynich claims to have found. But we know he would have heard the rumors at least by Dr. Raphael Mnišovský’s death in 1644. So why, on finding out the rumor, did Marci not immediately write Kircher and tell him? This very valuable information, so even if heard between 1641 and 1644, it should have… probably would have… been told to Kircher, to help him solve the riddle. It makes no logical sense that this was not shared. The most likely explanation is that this 1665 letter is a forgery, made up to add a valuable authorship and believable provenance to the manuscript. Countering my suspicions, it has been recently (May, 2014) suggested on the Voynich-net mailing list, that the 1665 letter would have been “more convincing” as a forgery if the information in it was not stated as a rumor, but more directly. Meaning, if a hypothetical forger would have been more specific in their description of the authorship and provenance, perhaps description, while they had the chance, they would have done a better job of cementing the authenticity of the manuscript. But this could not be done, and the chief reason is readily apparent: While sharing the Roger Bacon/Rudolf II/600 ducats rumors so late is somewhat damning to the authenticity of the 1665 Marci/Kircher letter, any direct claim of authorship and ownership, as fact, when not related earlier, would have been completely illogical, and revealed the letter as a fake. It would not be done if real, and could not be done, as a fake. So told as a rumor only, years after Marci knew it, was the only way to even barely insulate the fact that this important news was held back so long. Stating it as rumor was the only way to get away with it at all. And it has worked, so far. But looking at it more closely, against the known timeline of letters: inclusion in this letter to Kircher, this useful and valuable information so late- casts serious doubts on the letter’s authenticity.